its in moments like these that one realizes how insignificantly small we are in the whole scheme of things. to experience them is an enlightenment in itself! Stick people give great perspective! 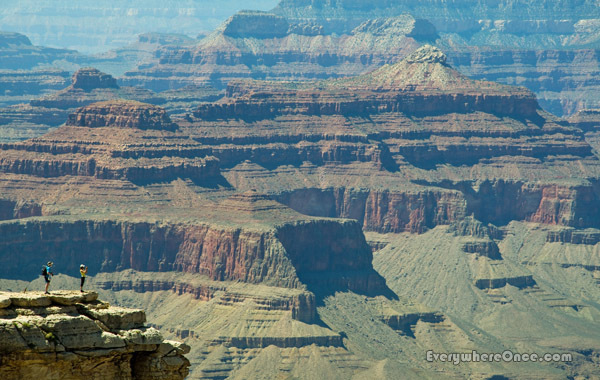 I remember when I saw the Grand Canyon with my own eyes – I was awestuck. It brought a lump to my throat. It’s fun to sit by the Visitor’s Center of the South Rim and listen to people who are seeing it for the first time. Holy Sh!t comes up a lot. LOL. Yes, it really is almost (completely?) impossible to convey the scale of Grand Canyon on film. Maybe not impossible, you just need a lot of film! Beautifully captured. Raunak said it best …. “how insignificantly small we are in the whole scheme of things” That’s what came to mind when I looked at the photo. I feel that way sometimes when I look up into the heavens ….. like a little tiny speck on the planet. It is beautiful there. I was there two years ago this week. I made sure to get people in some of the shot just to show the scale. We saw Hoover dam, Painted Desert, Sedona, and the Grand Canyon. ill probably get emotional if i go there. of being reminded how beautiful life is. I would love to go to some of these places you have been posting… until then, I will live through your photos. Absolutely beautiful. Armchair travel is part of the reason we’re here. Glad you’re enjoying it. I love the nature. Its beauty encourages and inspires spirits for human life..
We just visited the Grand Canyon for the first time this past fall. WOW. What an amazing sight! It’s difficult to even take it all in because of how vastly huge it is. Great photo of the rock!